President Emmanuel Macron vowed it would be rebuilt “even more beautifully”, adding that he wanted the work done within five years – although experts warn its reconstruction could take decades. 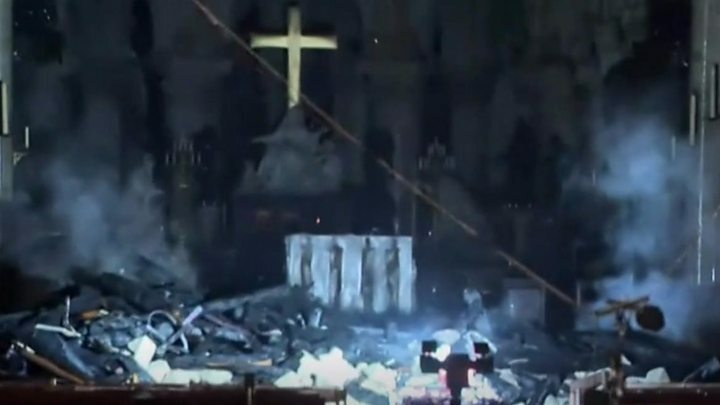 Meanwhile, a copper statue of a cockerel – a symbol of France – that topped the spire has been recovered from the rubble “battered but apparently restorable”, the culture ministry said. The cockerel contains holy relics, but it is not yet clear if these are still intact. Jacques Chanut, president of the French Building Federation, tweeted a picture of the statue being carried by Philippe Villeneuve, the architect in charge of the renovation project. Deputy Interior Minister Laurent Nuñez said the structure was in good condition “overall” but that “some vulnerabilities” had been found in the stone vaults and the remainder of the ceiling.